Oil spills are a particularly frightening and shocking environmental disaster, due in part to the immediately visible consequences to animals and habitat. Many state and federal agencies are involved in preventing and responding to oil spills. For details on the California Coastal Commission's role, visit our Oil Spill Program. 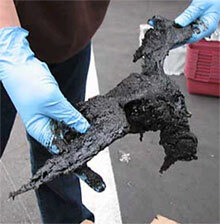 California has been the site of several large oil spills in recent history. In 1969, a blowout of a Union Oil drilling rig platform off the coast of Santa Barbara resulted in a spill of 4.2 million gallons of crude oil into the ocean and onto nearby shores. This disaster is considered to have been a catalyst for the modern environmental movement. In 1971, 800,000 gallons of bunker fuel spilled in San Francisco Bay, with a devestating impact on local species. In Huntington Beach in 1990, the American Trader oil tanker spilled more than 416,000 gallons of crude oil, killing an estimated 3,400 birds. In 2007, a container ship struck the Bay Bridge and spilled 58,000 gallons of bunker fuel into San Francisco Bay. A video is posted modeling the movement of that oil in the Bay. On May 19, 2015 a crude oil pipeline spilled 100,000 gallons into the ocean at Refugio State Beach in Santa Barbara County. Why is oil harmful to the environment? What is the government doing to prevent oil spills? What can you do to protect the ocean? Oil in the water can be deadly for animals. Oil is toxic when ingested. When birds get oil on their feathers, it impairs the important waterproofing that is necessary to keep a bird warm. A bird may also lose its ability to float in the water or to fly if it is covered in oil. Oiled marine mammals may suffer from hypothermia. Oil may cause reproductive problems and genetic abnormalities in fish. Contaminants may enter the food chain and result in seafood that is unfit for people to eat. As of November 26, 2007, 2,125 birds were either found dead or died after collection due to the Cosco Busan oil spill in San Francisco Bay. As of that date, 773 birds had been cleaned of oil and 188 of those had been released back into the Bay. Recovery workers after the 1989 Exxon Valdez incident, which spilled 11 million gallons of oil in Alaska, collected about 30,000 dead oiled birds and 1,000 dead sea otters, among other animals. Many other animals were likely affected but not recovered. Dolphin health was still being impacted years after the 2010 Deepwater Horizon explosion that spilled more than 130 million gallons into Gulf of Mexico waters. After the large Exxon Valdez oil spill in Alaska in 1989, both the United States and California governments enacted laws to help prevent oil spills. The International Safety Management Code, enforced since 1998, requires ships entering U.S. ports to meet certain standards, including procedures for reporting accidents and requiring qualified crew. 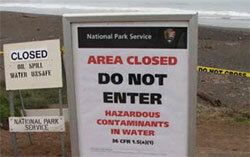 In 1990, the U.S. enacted the Oil Pollution Act (OPA). One of the things OPA did was require that oil tankers be double-hulled, and requires the phase out of existing single-hull tankers. A double-hull further protects a ship from damage to its cargo tank, reducing the risk of oil spilling during an accident. California enacted the Oil Spill Prevention and Response Act in 1990, which established the Office of Oil Spill Prevention and Response within the Department of Fish and Game, which is authorized to direct spill response, cleanup, and natural resource damage assessment activities, as well as regulate all private vessels over 300 gross tons (672,000 pounds) that enter California ports. What can you do to protect the Bay and the ocean? Although large oil spills are disastrous for people and wildlife, much of the oil spilled into the ocean comes from runoff from roadways that flows into storm drains and then into waterways. This means that individuals can have a big impact on the health of our coast and ocean. Become an oil spill response volunteer. Learn how to properly change and dispose of used motor oil. Get your car tuned up regularly. Walk, bike, take public transportation, and carpool instead of driving alone. Clean up a beach! Marine debris is another serious problem for the ocean. 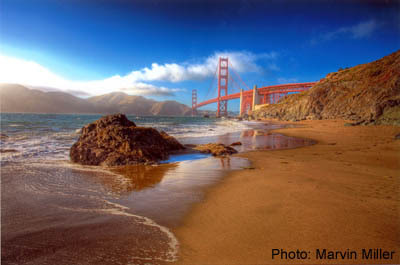 Take part in a beach cleanup like Coastal Cleanup Day or Adopt-A-Beach®. Prevent debris in the first place by practicing Reduce, Reuse, and Recycle (in that order)! Check out our Coastal Stewardship Pledge for more ideas on how to protect our coast and ocean.